All of us know that death is inevitable. One should remember this fact always. It is a mortal world. Whoever is born into this world has to die. No one can escape it. All the Medical innovations, all Scientific advancements, and all the Spiritual rituals and Prayers are all null at death. Whatever you may do, you can't avoid death. Lord Krishna in Bhagavad-Gita emphasized this fact to Arjuna and asked him not to lay down his Bow and Arrows in the Mahabharata with the grief of having to kill his kith and kin in the battle. He emphasized the fact that death for each one has been already pre-decided and Arjuna's arrows are only a tool for accomplishing the already decided fate of those people. So, death is pre-decided already at the time of the birth of each and every one of us. When Death is an inevitable end of every Birth is, why worry to die. Why do you break-up at the death of one of your dear ones? You can feel the loss of company and love. But don't get too much depressed or worried at the loss. But, it is a fact that death occurs at a time when you are unaware of it. It does not come to you straightforwardly. It doesn't provide you some hint. It doesn't even warn you before attacking. It attacks you suddenly and stealthily. Death finds some means to attack you. When you are well prepared and wait for it, it does not come to you. It attacks you stealthily, when you are confident that Death is not so much nearer to you, and when you are careless about it. 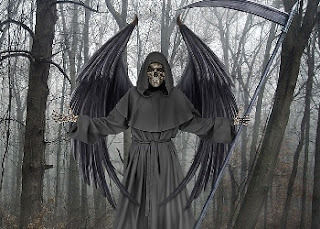 Death wants some reason or some circumstance through which it can pounce on you. It enters you through some sickness, some accident, some natural calamity, etc. so that you may think that because of this reason the death took place. As evident from Lord Krishna's teachings in Bhagavad-gita to Arjuna, the death to Kauravas enters through the medium of Arjuna's arrows. It is only an excuse. Because people always live in ignorance and do not realize that Death is a natural outcome of Birth. They always keep thinking that death occurred due to such and such a reason only. But, it is not the reality. We should come out of this ignorance and realize that Death is inevitable once you are born. Death is the ultimate destination for any person whoever comes on this earth. Even God, when takes avatars on this Earth, has to end his avatar through the form of Death like Sri Rama has ended his life by entering into the Sarayu River or like Sri Krishna ending his life with the shot of an arrow that has been released from the bow of a hunter. So, Death is an ultimate truth just like a Birth. Do not get bewildered by death. If you are born, you have to die. But always remember that Death is only for the physical form that you are in. Bhagavad-Gita clearly states that Atma in your body is Eternal. It has no Death. Death is only for the physical body. Just like you are changing your clothes, you are changing your body. The inner soul is the same. It does not change or perish. So be not afraid of Death. Be prepared for your final journey always and face it with a smile and warm welcome.